A 49-year-old woman who worked as a nurse at long-term care facilities in Woodstock and London has been charged with eight counts of first degree murder following a multi-jurisdiction homicide investigation. The investigation began on Sept. 29, when the Woodstock Police Service received information that eight people had been murdered between 2007 and 2014. Due to the nature of the allegations, a multi-jurisdictional major case manager was contacted. Det. Inspector Rob Hagerman of the OPP Criminal Investigation Branch was assigned to coordinate the investigation by members of the Woodstock Police Service and London Police Service. Police say the victims were administered a drug. Investigators would not comment on which drug specifically and or a possible motive. A nurse employed at the facilities, 49-year-old Elizabeth Tracey Mae Wettlaufer of Woodstock, is charged with eight counts of first degree murder. The accused appeared at the Ontario Court of Justice in Woodstock on Oct. 25 and was remanded into custody. Nursing home operator Caressant Care issued a statement Tuesday morning saying they are fully cooperating with the investigation. "We remain in regular contact with the Ministry of Health and Long-Term Care," said the statement. "Our highest priority is to continue to provide for the physical, social and spiritual needs of our residents, and that remains our focus. We deeply regret the additional grief and stress this is imposing on the families involved." Caressant Care operates 15 nursing homes across the province. Police say there is no further immediate threat to patient or community safety. Queen’s Park is not only refusing to make public which nursing homes it classifies as high-risk, the Health Ministry won’t allow its inspectors to state in public reports if their inspections were full-blown or a watered-down version the government will start using at most facilities starting next week. That will make it harder for Ontarians to choose which home to send a frail elderly relative, opposition health critics charge. Bartek Sadowski/BloombergDining will be among the key activities not observed during "lite" inspections at Ontario nursing homes, sources say. “For them to do it secretly, they either don’t have the money (for full inspections) or they have something to hide,” said Jeff Yurek, the Progressive Conservative health critic and MPP for Elgin-Middlesex-London. The secrecy isn’t new: Ontario Liberals said nothing of plans to scale back inspections at more than 500 of the province’s 630 nursing homes until questioned by Postmedia. Rather than do full inspections annually, the ministry has designated 84 per cent of homes as low risk, and they will get a full inspection only once every three years, sources say. The other two years, those homes will get what inspectors and homes themselves are calling a “lite” inspection with one-quarter the staffing and many key areas, from staffing to security, off the table for formal review. Postmedia last week asked the ministry to make public which homes were deemed low-, medium- and high-risk so that Ontarians can know before they chose a home for a loved one. Ministry officials initially said the classifications hadn’t been finalized even though sources say the “lite” inspections start next week, then took it further, saying they would never disclose the classifications to the public. Asked repeatedly whether inspectors would be allowed to mark on public inspection reports if they conducted a full or just a “lite” inspection, a ministry spokesperson issued statements that didn’t address the question, then replied that there would not be that added information. “The ministry’s inspection reports will continue to provide the same information,” spokesperson David Jensen wrote. The inspection reports do disclose the number of inspectors and the number of days they spent at a home, but that will be little use to Ontarians who don’t know that full inspections involved three or four inspectors for two weeks while lite inspections only involve two inspectors for one week. The change by Ontario Liberals is a full retreat from three years ago, Gelinas said, when former health minister Deb Matthews went public with plans to more than double the number of inspectors so that all nursing homes would get a full annual inspection — a reversal that came only after Postmedia showed how the Ontario government had violated its own laws meant to protect residents of nursing homes. The new inspectors weren’t enough. Though each home received a full inspection last year, that stretched inspectors so thinly, they delayed by months investigations into critical incidents and complaints, a problem highlighted by Ontario Auditor General Bonnie Lysyk. The changes to inspections were made after lobbying by owners and operators of nursing homes. Concerns about care in nursing homes in London intensified after two facilities were recently rocked by regulators. Registered practical nurse Susan Muzylowsky admitted mistreating 19 residents at Mount Hope Centre in 2014, while Earls Court Village was ordered to stop taking new residents after inspectors found 37 violations, many endemic since the place opened in 2014. THOROLD — Hundreds of bright blue balloons surrounded the bandshell at the Battle of Beaverdams Park in Thorold on Saturday as the Canadian Union of Public Employees held a rally to back calls for legislated standard of care in Ontario nursing homes. CUPE used the event to publicize its ‘Time to Care’ campaign, pressuring the province to deliver on a promise that CUPE said was made back in 2003 to legislate a minimum daily care standard for Ontario’s 80,000 long-term care residents. Since 1992, the complexity of care needs of Ontario’s long-term care residents — the majority of whom are now 85 years of age or older — has increased significantly, said CUPE. 73 per cent of residents now have some form of dementia, and most need help with feeding, bathing, toileting and getting out of bed. The union is demanding changes to the Long-Term Care Act for a legislated care of a minimum of four hours per resident per day, adjusted for case mix and acuity level. The union also wants public funding for homes tied to the provision of quality care and staffing levels, and for public reporting of staffing levels to be mandatory. Last year, CUPE Ontario secretary-treasurer Candace Rennick said staff in nursing homes are now running from resident to resident, with the situation getting worse. Duff said home workers would love the luxury of simply having a few moments to chat with residents about the weather or current events, but the Time for Care campaign is about giving basic care for residents, she said. “It’s certainly not a lack of commitment by staff: they’re coming in early, skipping breaks and staying late,” said Duff. “(But) they just don’t have time,” she said, noting residents can wait for three to four hours to be taken to a toilet when there may be only one registered nurse and two personal support workers to handle 40 or 50 residents on a ward. CUPE said it’s been more than 10 years since an inquest into the deaths of two long-term care residents in 2001. The jury came back with 85 recommendations, which health care staff say were never implemented by the province. Duff said her union hopes people will contact their MPPs to urge them to have the province take action on the issue. 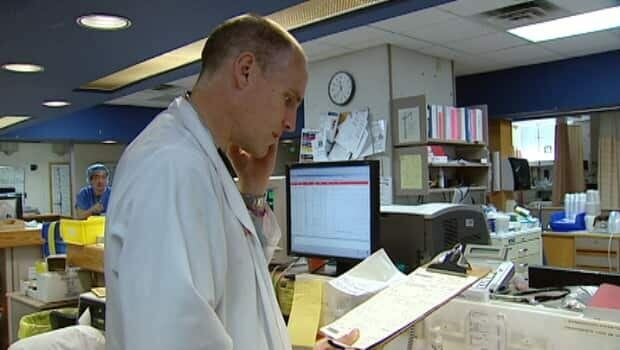 CBC News asked Dr. Samuel Campbell, the chief of the emergency department at the Halifax Infirmary, to write an editorial regarding the increasing number of long-term care patients coming to the ER. When I was asked to write a blog regarding my comments last week about frail patients occupying space in the emergency department, I wanted to hide. The comments I made were correctly quoted — yet, when I read them I realize how harsh and unsympathetic they sound. I have also heard that my words have been interpreted as an attack on families that feel desperate and don't know what else to do than take family members to the emergency department. I can see how this has happened and regret not spending more time in choosing my words. My comments were triggered by increasing frustration with our ability to supply the emergency care that we are contracted by the public to provide. While patients with social needs are not less important than others, I can't imagine that the public at large would approve of their emergency department taking on non-emergency issues at the expense of emergency patients. Currently, almost half of the emergency beds in the two 24-hour emergency departments in Halifax and Dartmouth are occupied by patients that no longer need emergency care, but can't go home. Most of them are admitted patients waiting for inpatient beds, and this national crisis has been recognized for some years and much has — and is — being done to try to address it. It is important for me to acknowledge that the hospital — especially the department of medicine that admits the most patients and thus has the most patients spending long times in the emergency department — have made a gargantuan effort in trying to improve the flow of patients. Recently, the use of beds for frail patients who are unable to be cared for at home but who have no active medical problems is becoming more and more common. There are fewer of them than there are admitted patients, but the former stay for so much longer that their impact on patient access is significant. Last Monday, there were four such patients at the Halifax Infirmary emergency department. When that's added to the 17 patients admitted or waiting for admission, the emergency department had essentially shrunk from 36 beds to 15. Those 15 beds include six that are only designed to manage low acuity patients and eight in a "chair centric" area that requires patients to sit in a chair for part of their stay, freeing up the beds for other patients. That means, with a full waiting room, we really only had one bed available for someone who, for example, had a heart attack or suffered major trauma. That morning, some of the patients we saw had waited 12 to 15 hours for care — and many more had left without being seen after long waits. We have a beautiful, modern and new emergency department; if we were able to use it for the purpose that it is designed, there would be no problem with ambulance off-loads and few waits for sick patients. I've been told that I am part of an acute care system that refuses to take ownership for certain social issues, and thus as guilty as anyone. This is probably true and I am not trying to blame or shame anyone. This is a complex problem. Nursing home placement is a practice that is best not rushed, so that the best option for each candidate can be found, while being responsible with the use of resources. Continuing care has done an amazing job at expediting access to long-term care and have been great at getting extra services to people at home so that they can wait for a nursing home bed in the comfort of familiar surroundings. I am also asked what the solution to this issue might be. As someone who tells people to bring solutions — not problems — I realize that I have not followed my own mantra. Who is the space intended for? Mine is simply the perspective of an emergency physician trying to do his job. I do not have the solution to the issue of frail or 'adult protection' patients who have nowhere to go. All I can say is that the emergency department should not be considered an option and neither should acute inpatient beds, which are needed for sick in-patients. Were we able to adequately manage the suffering that it is our job to do, we would happily take on the needs of people who fall outside our zone of responsibility. In the meantime, we have to advocate for the people for whom the space is intended.